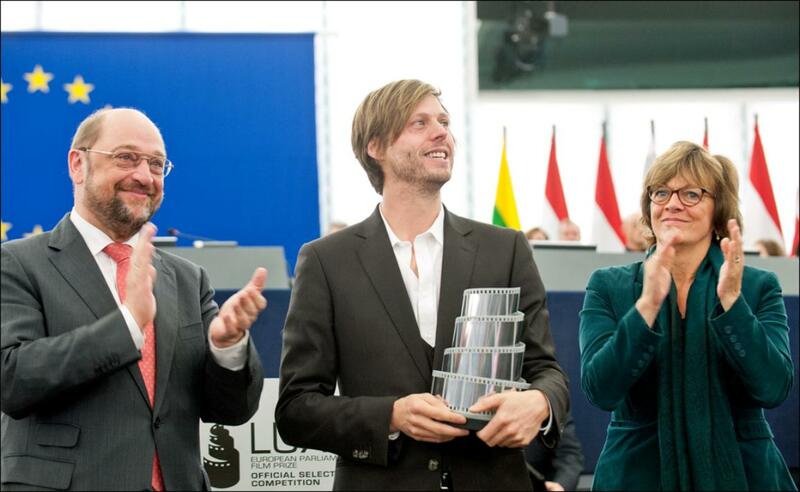 Felix van Groeningen (middle) receives the 2013 LUX Prize for his film "The Broken Circle Breakdown"
"The Broken Circle Breakdown", a musical love story about a Belgium couple coping with a tragic loss, won the European Parliament's 2013 LUX Prize. Accepting the award from President Martin Schulz, director Felix van Groeningen said: "The LUX prize is a great initiative - it makes you watch a film that you otherwise wouldn’t have." The LUX Film Prize is awarded every year to films that promote European cinematography, values and social issues. Other finalists competing for the prize were British film "Selfish Giant" directed by Clio Bernard and "Miele", an Italian and French film by Valeria Golino. Mr Schulz congratulated the winner and all the finalists: "By telling stories about who we are or who we could be, European films help to create a cultural consciousness for Europe. Film makers do not need us, European politicians, but we politicians need you, the film makers. Stories and emotions can help to develop identity. European films boost a feeling of togetherness in Europe." Felix van Groeningen thanked the MEPs: "It's an incredible honour to know that the MEPs actually chose my film, watched it and voted for me. That is why the LUX prize is a great initiative - it makes you watch a film that you otherwise wouldn’t have. It makes it possible for films to reach different territories and countries so that many people can see it. That is why we make the movies." The Parliament gives out the award each year to help promote films that go to the heart of the public debate in Europe. Films in the finals were subtitled in all of the EU's 24 official languages and shown to the public during the LUX Film Days. This year, this festival of European cinematography was bigger than ever, taking place in all 28 member states. Even though MEPs have already picked their favourite film, the public can still vote for theirs on the LUX prize website or on the LUX Prize Facebook page. One lucky winner will be invited to the Karlovy Vary International Film Festival in June/July 2014 where the 10 films competing for next year’s prize will be revealed. Starting 8 March 2014, French/German broadcaster ARTE will make the film "Die Fremde" by Feo Aladag available online for free for three months. The film, which won the LUX Prize in 2010, will be available in all 24 EU languages. The 2013 LUX Prize was awarded in Strasbourg on 11 December 2013.